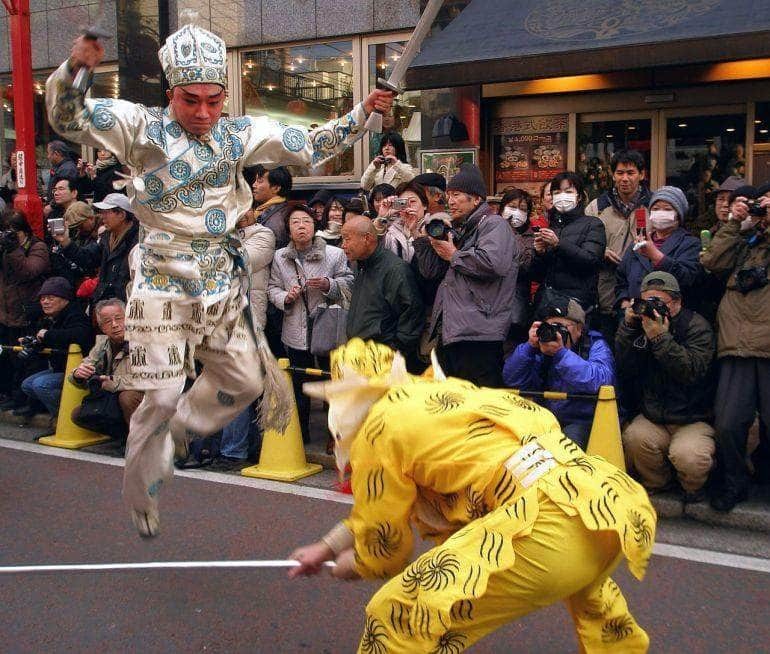 Following on from the 9th day of the Chinese Spring Festival – which is the birthday of the Jade Emperor, King of the Heavens – there will be a parade through Yokohama’s Chukagai, or Chinatown. Although advertised simply as a celebration parade, the 9th day of the festival is also apparently the day to hold a birthday party for The Jade Emperor. The parade will feature traditional costumes, lion dances and dragon dances. Whereas the lion dance usually has two dancers in one costume, the dragon dance has multiple performers holding up the dragon and due to its complexity, the longer the dragon, the luckier it is. Traditionally the Chinese dragon was associated with water and etymology fans might be interested to know that the Japanese words for waterfall, taki 滝, or tornado/waterspout, tatsumaki 竜巻, contain a kanji character meaning dragon: ryuu 竜. Hopefully it won’t rain on the parade and good luck will come to all those present. The 10th day of the Spring Festival is also a day for feasting so finish off your evening at one of Chinatown’s many, many restaurants. The parade starts and finishes in Yamashita-cho Park.